Brian Leslie Blair (born January 12, 1959) is an American politician and professional wrestler. He is best known for his appearances with the World Wrestling Federation (WWF) under the ring name B. Brian Blair as one half of the tag team The Killer Bees in the 1980s. As a child, Blair wanted to be Superman and even prayed that he might somehow become a superhero. By the time he was in high school, he also worked out to help out his parents. Blair moved out of his house at age 16 and held several jobs to pay his share of the rent. Brian started competing in sports in junior high school and won city championships well as a regional junior high school heavy weight against Ronald Reddick. In high school, he lettered 9 times in various sports such as football, baseball, track and field. Blair won many accolades in high school other than sports; he was named Mr. Titan and was voted "Best all Around" his senior year. To this day he holds the record for most letters in Hillsborough County High School in Tampa Bay, Florida. Blair loved professional wrestling and wrestled and played football in high school so he could be tough enough to do it when he graduated. After graduating at the age of 17, Blair started training in the summer for CWF located at 106 N. Albany Street where the CWF tapings were held every Wednesday. Blair had his heart set on playing football for the then NCAA division 2 Power-house, at the University of Tampa, where he sold sodas to the fans and watched his favorite players, Freddie Solomon and Paul Orndorff. The University of Tampa folded their football program, largely due to the new arrival of the Tampa Bay Buccaneers. Deeply saddened, Blair attended Saint Leo College near Dade City under coach Tillrow Morrison, then transferred to the University of Louisville on a football scholarship, although he never earned a varsity letter; he majored in both business and political science. In the summers of 1975 - 1977 prior to Saint Leo, College then to the University of Louisville, Blair started training to be a wrestler with the legendary Hiro Matsuda in Florida. Blair debuted in mid-1977 with Eddie Graham's Championship Wrestling from Florida (CWF) where he usually worked as a "face" (good guy). Blair's debut was a tag-team match facing Pat Patterson and Ivan Koloff in a losing effort. One of Blair's early opponents was another Matsuda student who had just begun working as "The Super Destroyer" (Hulk Hogan). After Florida, Blair moved on to Bob Geigel's NWA Central States promotion out of Kansas City around 1978 where he finally started to make a name for himself as he feuded with Jesse Ventura in 1979. Blair also teamed up with "Bulldog" Bob Brown and won the Central States Tag Team Belts. He also appeared regularly for Leroy McGuirk's Tri-State promotion, here he met and married Leroy McGuirk's daughter Michelle, aka Mike McGuirk in 1980. The marriage did not last long and ended on a bad note when Blair found out that Mike was having an affair with wrestler Doug Somers while they were estranged. He was even shot at by Leroy when he tried to talk to Mike before leaving town. While in the Tri-State promotion Blair won the Junior Heavyweight Title from Ron Starr but only held it for about a week before losing it back to Starr. The one-week reign was Blair's first professional wrestling title reign. After leaving the Tri-State promotion Blair joined up with Fritz Von Erich's World Class Championship Wrestling promotion in Texas, where he lived with David Von Erich for well over a year. In WCCW he quickly gained victories over Killer Tim Brooks and former WWWF World Champion Stan Stasiak. During his time in Texas he was asked by Al Madril to be his partner in a tournament to crown new American tag-team Champions. Madril and Blair were successful kicking off a three-month run with the title. Their run with the gold was cut short by Killer Tim Brooks and Armand Hussein in September, 1981. 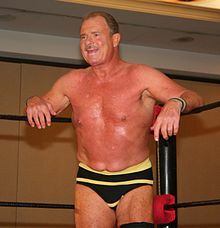 At this point in time Blair was given a golden opportunity as he was booked by Vince McMahon, Sr. to wrestle for the World Wrestling Federation (WWF) most notably on their tours of Japan through New Japan Pro Wrestling (NJPW) where Blair faced Japanese icons Antonio Inoki and Tatsumi Fujinami. After gaining experience all over the world Blair returned to his roots, Championship Wrestling from Florida. On July 11, 1982, Blair beat Jimmy Garvin for the NWA Florida Championship and defended it successfully against such legends such as Stan Hansen and Bruiser Brody. After a wild match against Brody in August the title was held up and Blair soon left the promotion. Blair returned to CWF in 84/85 defeating Jesse Bar on January 6, 1985 for his second run as Florida Heavyweight Champion. In 1983 Blair joined the WWF once again as they began to expand to a national promotion. During his first stint with the WWF his self-proclaimed highlight was a match with Paul Orndorff in St. Louis. After the short run with the WWF, Blair moved on to Georgia Championship Wrestling as well as a return to Florida Championship Wrestling. In Florida, Blair picked up another Florida title run as well as unseating "Ravishing" Rick Rude as the Florida Southern Champion. During his run with the WWF in 1984, Blair often teamed with fellow wrestler Tony Garea. The team of Blair and Garea would dominate pure jobbers, but were unable to move up the card against more established tag teams. They teamed up until Blair left later in that same year. When Blair signed with the WWF for a third time he was not just used as "enhancement talent" any more, instead he was teamed up with Jim Brunzell to form The Killer Bees. The teaming of Blair and Brunzell was suggested by Hulk Hogan. The team had a special gimmick referred to as "Masked Confusion" where both wrestlers pulled out identical masks during the match to confuse their opponents and usually win their matches that way. The "Masked Confusion" idea was given to Blair by Billy Red Lyons who had used it in Maple Leaf Wrestling. They constantly challenged for the WWF World Tag Team Title but never won it, although the fans were thoroughly behind them. Their biggest feud in the WWF was against The Hart Foundation, Bret Hart and Jim Neidhart whom they wrestled somewhere between "300 and 600" times according to Blair himself. The Bees also had a running feud with the Funks (Hoss, Terry and Jimmy Jack). They faced Hoss and Jimmy Jack Funk in front of 70,000 people at The Big Event in Toronto (a card headlined by Hulk Hogan and Paul Orndorff). Later in 1988, The team was split without any reason, and they ended up competing in the singles division. Brunzell remained with the WWF into the early 1990s. In the fall of 1988, Blair left the WWF amid claims that the team had been promised the WWF Tag Team Championship three times by company owner Vince McMahon, but the promises were never kept. Blair also claims he was asked to help heel team The Brain Busters (Arn Anderson and Tully Blanchard) win matches. Not wanting to become a heel, Blair refused and quit instead. Brunzell and Blair later complained about WWF owner Vince McMahon who continued merchandising products of The Killer Bees without their permission or financial compensation. Blair and Brunzell wrestled at Wrestlemania 2, 3 and 4 before Blair gave his notice in Salisbury, MD right before Wrestlemania 5. The Killer Bees also won the Frank Tunney Memorial Tag Team Tournament in Toronto, Canada, were winners at the first Survivor Series, performed at The Big Event in Toronto, Canada, and at the first Royal Rumble. The Killer Bees were also featured on many Saturday Night's Main Event cards. Bret Hart states in his book "My Real Life in the Cartoon World of Wrestling", that the best tag team match of his career was against Blair and Brunzell. After leaving the WWF in 1988, Blair returned to wrestling in 1990 as Blair signed a short-term contract with Verne Gagne's American Wrestling Association. Blair challenged Larry Zbyszko for the AWA World Heavyweight Championship. Blair defeated Zbyszko by disqualification meaning the title couldn't change hands that way with Zbyszko retaining the title. Blair was one of the first "names" to work regularly for Herb Abrams Universal Wrestling Federation (UWF) when it opened its doors in late 1990 quickly becoming a regular on the federations Fury Hour shows. In the UWF, Blair reunited with Jim Brunzell but due to the WWF holding the trademark to the name "The Killer Bees" they were billed as "Masked Confusion". They competed on the UWF's first (and only) PPV, Beach Brawl, where they beat the Power Twins. The team was also the only UWF Tag Team champions. They won the title at UWF's last big show known as Blackjack Brawl where they beat the "New Powers of Pain" (The Warlord and Power Warrior). The Bees would also regularly wrestle as one of the top tag teams in the UWF's Fury Hour. Blair was given was a big push in the UWF, usually defeating the UWF's preliminary talent, and even one of the top heels of the company who he also feuded with, Bob Orton, Jr..
After the UWF folded, Blair continued to compete on the independent circuit, especially around his home state of Florida. Through the mid-1990s, Blair also travelled to Japan regularly and wrestled for New Japan Pro Wrestling usually as "Brian Blair" or "The Killer Bee". In 1998, Blair won the NWA Florida Tag Team Championship with Steve Keirn holding the title from November 13, 1998 to August 15, 2000 when the title was vacated following a match with the Bushwhackers. Blair and Keirn faced off in a singles match to determine who got to pick a new partner; Blair won and picked local star Cyborg The Wrestler (Kevin Donofrio) as his partner. The two held the tag team titles until July 10, 2001 where they were forced to forfeit the title due to injuries. On March 31, 2012, Blair returned to the ring as he teamed up with Carlos Colon, Lanny Poffo, and Mike Graham as "Florida Team" to defeat the team of Gary Royal, Larry Zbyszko, Ron Bass, and The Masked Superstar (as "Georgia Team") in an eight-man tag team elimination match on an event held on his home-state of Florida. Blair and Graham were the sole survivors. On April 14, 2013, Brian Blair faced Matt Riviera for the Vendetta Pro Wrestling annual event "Pro Casino Royale" edition of 2013. On August 5, 2014, B. Brian Blair faced wrestler "The Tokyo Monster" Kahagas for American Pro Made Wrestling promotion in a winning effort for Blair. On September 3, 2014, Blair faced former rival Matt Riviera for the annual National Wrestling Alliance event "Mid-Atlantic Legends Fanfest" edition of 2014. Riviera said some days before the match he would "humble" Blair. This was a reference to many of The Iron Sheik's remarks towards Blair. Blair was defeated. On October 26, 2014, Blair faced The Cuban Assassin for the annual NWA "WrestleFest" in a winning effort for Blair. On July 21, 2016 Blair competed on the Impact Pro Wrestling George Tragos/Lou Thesz Hall of Fame show teaming with Wes Brisco & "Hot Fire" Myron Reid taking on AJ Smooth, Justin Decent, and Aaron Von Barron. Blair had his last match at the "Tragos-Thesz "Pro-Wrestling Hall of Fame" on July 22, 2017, where he successfully tagged with Wes Brisco. Both Blair (2015 - Thesz) and Brunzell (2014 - "Mazurki" are Iowa HOF inductees. As of November 2017, Blair and Brunzell are still in high Demand now working many Comic-Cons and Independent Autograph Sessions. Both Blair and Brunzell have a new Comic Book Series called the "Killer Bees" a true life story (animated) about Blair and Brunzell's journey to become Pro-wrestlers available at Inversepress.com. Blair is married to Toni Sabella and they have two sons, Brett (named after professional wrestler Bret Hart) and Bradley. Brian Blair owned and managed four Gold's Gym fitness centers in the Tampa Bay area with fellow wrestler, Steve Keirn. They were sold in 1999 for 2.1 million. Brian Blair's first attempt for a seat on the county commission was against Pat Frank but he lost in the 2002 race by a narrow margin. In 2004, Blair ran again and was elected County Commissioner, District 6 (countywide) for Hillsborough County defeating former city councilman Bob Buckhorn. The race was one the closest county commission races in the history of Hillsborough County with Blair winning with 216,430 votes to Buckhorn's 214,062. In 2008 Blair ran for re-election winning the Republican primary against Don Kruse on August 26, 2008, then lost to Hillsborough County's first openly gay candidate Kevin Beckner in the November 4, 2008 general election. One great concept that Brian had was of the senior zone. It was designed to warn other drivers and to be cautious of senior citizens exiting or entering their parking lots. "A senior zone slows down traffic without the need for a traffic light. We found that here in Florida, senior citizens prefer having traffic lights near certain entrances or exits of lots. The traffic lights we originally were looking at were too expensive. I worked with a traffic engineer and we came up with senior signs that are posted with flashing caution lights and 'reduce speed limit' written on the pavement. The cost of this whole project would have been the same cost of a traffic light. It reduced accidents a great deal and just like all citizens, the senior citizens safety is a high priority in our community" said Brian. The senior zone was voted number one and got picked for the most innovated project of the year in 2008. He is also a Christian and is active in his church, Idlewild Baptist. In the summer of 1990, Blair was present when Brutus Beefcake had a near fatal para-sailing accident. In fact, Blair was the person to pull Brutus out of the water after being struck in the face by the knees of a novice parasailer. ^ a b c d e Online World of Wrestling. "Brian Blair Profile". Retrieved 2010-12-12. ^ "All-Time Letterwinners" (PDF). 2013 Louisville Cardinals Football Media Guide. University of Louisville Athletics. pp. 185–88. Retrieved March 3, 2014. ^ a b c d e f Chad Bonham (2001). Wrestling with God. RiverOak Publishing. ISBN 1-58919-935-9. ^ a b "B.Brian Blair Chat". May 2001. Retrieved 2007-03-12. ^ a b Shields, Brian (2006). Main event – WWE in the raging 80s (4th ed.). Pocket Books. ISBN 978-1-4165-3257-6. ^ "B.Brian Blair believed in his book". 2003-05-01. Retrieved 2007-03-12. ^ Oliver, Greg (2004-06-26). "B. Brian Blair runs again". Retrieved 2007-04-07. ^ Johnson, Mike (2014-10-07). "Brian Blair to be awarded 2015 Lou Thesz Award". Pro Wrestling Insider. Retrieved 2014-10-08.